Senator Bill Nelson isn’t happy about this. 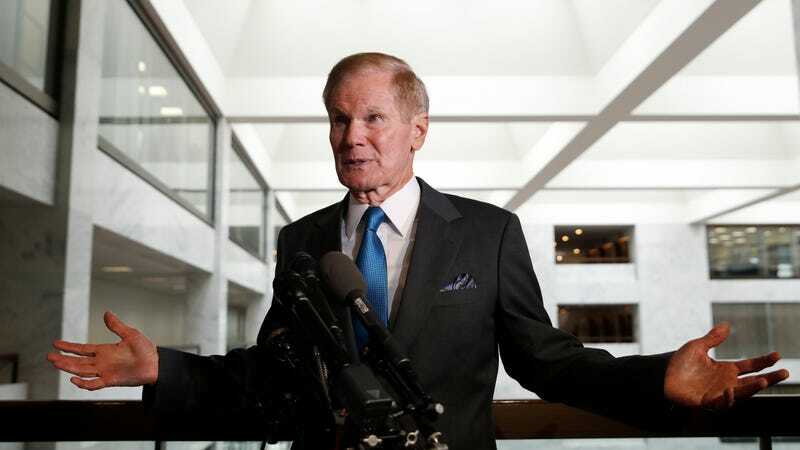 Florida Senator Bill Nelson is none too happy that the Trump administration got away with killing NASA’s Carbon Monitoring System (CMS). And it seems he won’t let the program go down without a fight. On Friday, the Democratic Senator and former astronaut sent a letter to top Congressional appropriators expressing “deep concern” over the canceling of the CMS research program, a move Science Magazine first reported on May 9. The program, which has been around since 2010 and has supported more than 60 research projects, provides data on greenhouse gas emissions and carbon stocks to support national and international policies and regulations. In case it’s not abundantly clear by now, policies surrounding regulation of climate-warming greenhouse gases like carbon dioxide and methane are not exactly something the Trump administration is about. He’s right: At $10 million, the CMS program is far cheaper than, say, the Orbiting Carbon Observatory 3, the Climate Absolute Radiance and Refractivity Observatory, or the Plankton, Aerosol, Cloud, ocean Ecosystem, three future satellite-based Earth science missions Trump proposed cutting in his 2018 fiscal year budget proposal. Those satellite programs were all put back in the budget by Congress, which managed to keep Earth science’s overall budget flat at 1.9 billion for 2018. A key difference with CMS, Science reports, is that the satellite-based programs all had private companies lobbying for them. But while CMS might have slipped through the cracks—it wasn’t explicitly included in the new spending deal and NASA, seemingly out of an abundance of caution, decided not to continue it—the program apparently does have some congressional friends waiting in the wings. A spokesman for Nelson told E&E News the senator wants to bring the program back in the FY-2019 budget. If that were to happen, NASA might not even feel its disappearance too much. After all, programs currently funded under CMS haven’t been canceled, it’s just that new projects aren’t happening. Federal agencies from the Interior Department to the Environmental Protection Agency have seen climate change research sidelined and censored since Trump took over. So far, NASA’s leadership has largely fended off executive branch interference. We’ll see whether that lucky streak continues under its brand-new administrator. Update 5/18: In a surprising turnaround, the House Appropriations Committee voted yesterday to reinstate the $10 million NASA needs to continue the Carbon Monitoring Program in an amendment to a 2019 spending bill. According to Science Magazine, representative John Culberson (R-TX), who heads up the spending panel that oversees NASA, reportedly gave his colleague Matt Cartwright (D-PA) a shoutout for urging that CMS funding be restored. Democracy in action!